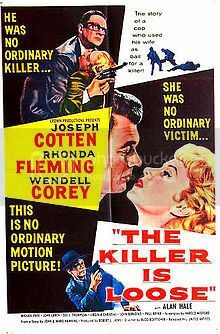 “He was no ordinary killer … She was no ordinary victim … This is no ordinary motion picture!” In this fairly entertaining, offbeat film noir directed by Budd Boetticher that features a running time of just 73 minutes, seemingly mild-mannered, bespectacled bank teller “Leon ‘Foggy’ Poole” (the absolutely brilliant Wendell Corey) gets nabbed for his part in a robbery. However, while apprehending Poole, “Detective Sam Wagner” (Joseph Cotten) accidentally kills the suspect’s wife. Poole (who turns out to be totally batshit crazy by the way!) gets sent to prison, eventually escapes (leaving a trail of several bodies in his wake) and sets off to track down and kill Wagner’s wife “Lila” (Rhonda Fleming) for revenge. Look for John Larch as “Otto Flanders,” Virginia Christine as “Mary Gillespie,” Alan Hale Jr. as “Denny” and Michael Pate as “Gillespie.” Lucien Ballard (The Killing) served as cinematographer.